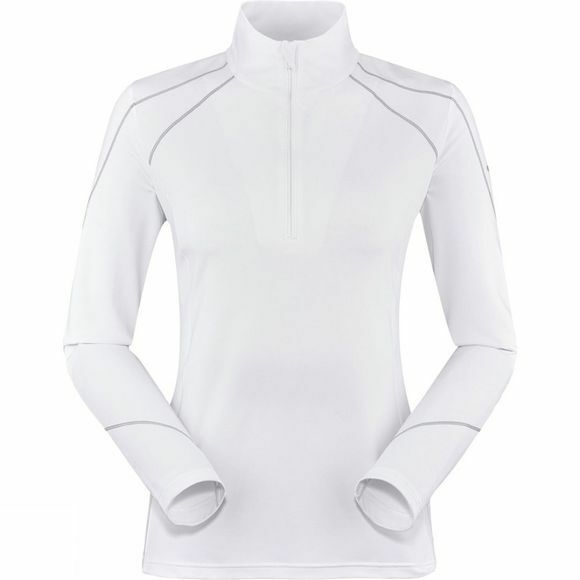 A sporty, ultra-feminine half-zip with fine detailing: soft, stretchy and warm. Wear it as a base or second layer under a Focus jacket. The design detail which erases a garment from your mind when passing through autumn undergrowth, which protects us when the wind ambushes us at a pass, which enhances the pleasure we feel when traveling through the mountains, in the Alps and elsewhere. This is the vision tailor Georges Ducruet had when creating Eider in 1962. Over 50 years on and Eider is still being designed in its birth place, in the heart of the alps, Annecy. Eider fuses know how, with boldness and technology to create apparel that reflects our sporting disciplines, whilst fitting into a gentle relationship with the environment. When Eider select materials, the processes, suppliers, people and the environment, are all respected in order to obtain the finest materials. Eider pays particular care to the detailing, cut and fit of their garments. What matters to them is that you look good and feel good, all the time, as a piece of apparel is a statement about an individual’s personality, its designer and the person who wears it, uses it, brings it to life.